The copy of Shakespeare’s first folio discovered at Mount Stuart on the Isle of Bute. The edition is unusual because it was bound in three volumes. Photo Credit: University of Oxford/PA/The Guardian. 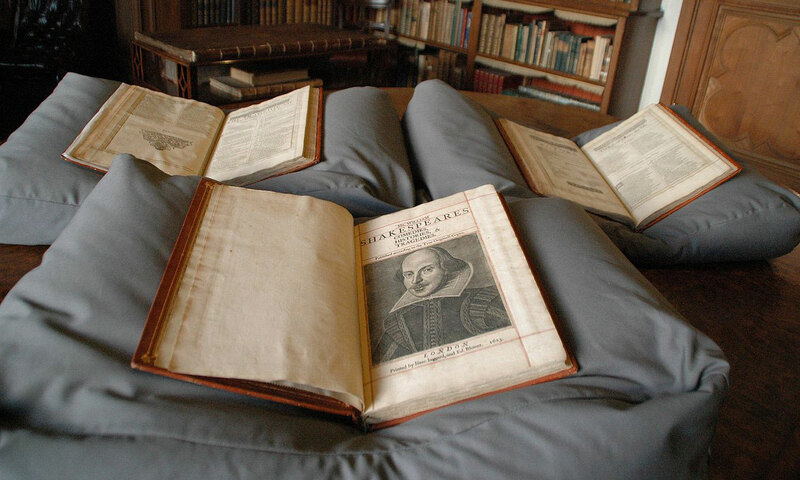 A previously unknown rare copy of Shakespeare’s First Folio from a mansion library at a Scottish Island has been confirmed as genuine. The First Folio is a collection of William Shakespeare’s 36 plays published in 1623, seven years after his death. Had it not been for the First Folio today there would be no copies of more than half of Shakespeare’s plays, including Macbeth and The Tempest. So far there had been only 233 known copies, but now, a few days before the 400th anniversary of Shakespeare’s death on 23 April, their number has risen by one. The Folio was part of the collection in the library of Mount Stuart on the Isle of Bute for more than 100 years. It belonged to Isaac Reed, a literary editor working in London in the 18th century, who acquired it in 1786. After Reed’s death in 1807 the copy was sold to a “JW” for £38. It was not included in Sidney Lee’s 1906 census of first folios, and it next appeared in a catalogue of the library in 1896, so it was probably acquired by Mount Stuart at some point between 1807 and 1906. Alice Martin, Mount Stuart’s head of historic collections, believes it was bought by the third Marquess of Bute, an antiquarian and collector, who died in 1900. The edition is bound in three volumes with many blank pages which would probably have been used for illustrations. It also includes annotations and notes from Reed which indicate its significance as a working document. The Folio was authenticated as genuine by Emma Smith, professor of Shakespeare Studies at Oxford University. The Folio will be on display for the first time at Mount Stuart as part of an exhibition that will run until 30th October.